How does Insycle use and manage API calls? Insycle has a fully automated, adaptive and tunable algorithm to manage API calls to ensure reliable and predictable operation and to avoid overuse or potential impact to other apps. 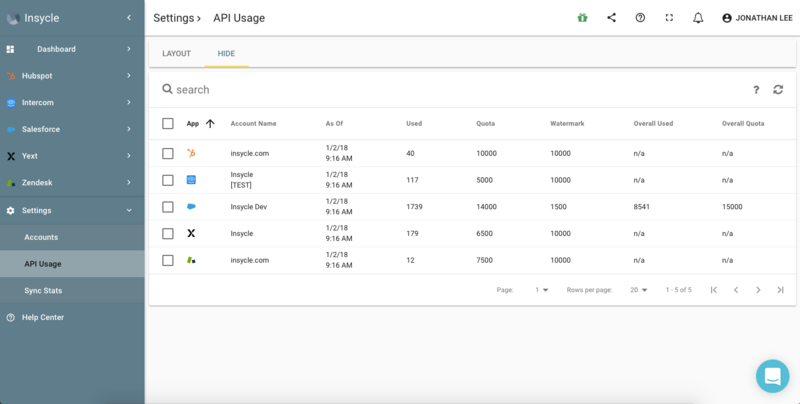 In the same way that Insycle provides unified interface to manage data across connected apps, Insycle implements unified controls to manage API use. Watermark: when remaining API calls reach this threshold, Insycle stops making API calls. The Watermark can be specified using percentage of available APIs, a fixed number, or both. Quota: pre-set the number of API calls that Insycle can make in a day, once the quota is exhausted Insycle stops making API calls. The Quota can be specified using percentage of available APIs, a fixed number, or both. Insycle automatically meters and logs any API call and has alert system in place. At any point our team will be able to provide detailed breakdown and analysis of the API calls made by Insycle. To review API usage and configuration in realtime go to API Usage under Settings.